Congrats to Anatolii and Leon for passing their Written Exam! Congratulations to Anatolii and Leon for passing their written exam in Chemistry! May 13, 2014 Congrats to Seyoung for passing her Written Exam! December 3, 2013 Congrats to Victoria and Jie for passing their Written Exam! 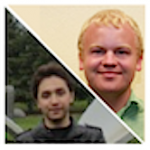 March 11, 2015 Congrats to Anatolii and Leon for passing their Oral Exam!